We spent an afternoon in San Antonio earlier this year, riding the Mission Reach Trail. Looks like it’s time to return to check out SA Current‘s suggested bike tour of local brews. It’s a DIY ride visiting six breweries in about six miles. That’s a brewery PER mile, so take your time and enjoy some food at the outset and maybe again at Blue Star. The author also suggests taking a short detour to enjoy the view of downtown SA from the nearby Hays Street Bridge. Since this is a DIY ride, you’ll need a bike. If you don’t have one, we suggest B-Cycle’s bike share. Better yet, why not rent a bike at Blue Star Bicycling Company, conveniently located next to the third stop at Blue Star? Start the tour in the middle and cycle both ways — that’ll add a few more miles to the beer/mile ratio! You’ll also need a map. For now, here’s a Google Map to try. We’ll get busy on getting back to the Alamo City and riding this in person. San Antonio has recently completed major upgrades and extensions to the original downtown Riverwalk which is very much focused on food and fun. The Eagleland segment extends the pedestrian portion of the Riverwalk to the Blue Star Complex. 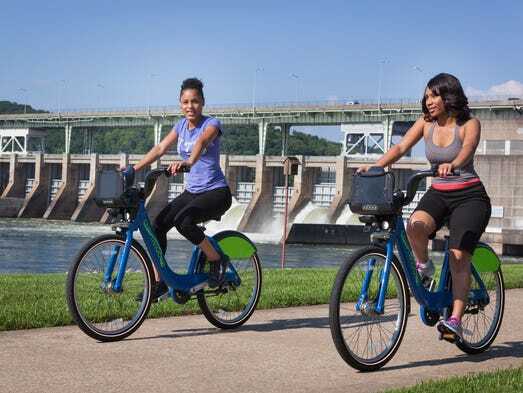 The Mission Reach Trail starts here and provides cyclists and walkers access to four historic missions, recreational facilities, picnic tables, and views of river wildlife in a semi-urban setting. North of downtown, the Museum Reach Trail is nearing completion for access to several museums and the zoo. I rode from the Blue Star Complex to the southern end of the Mission Trail and back on a perfect February afternoon in Texas. In addition to visiting all of the well cared for missions, I spotted a pair of golden eagles, numerous turtles, ducks and other water fowl as well as a large snake. Although I brought my bike from Austin, there are B-Cycle stations located at all of the missions as well as many of the road intersections. B-Cycle would be ideal for short rides between two or three missions. But the bikes are fairly heavy and the trail was hillier than expected. If you intend on riding the full length, consider renting a bike from Blue Star Bicycling Company located in the Blue Star Complex at the north end of the trail. From there, if you visit all four missions, plan on riding about 22 miles. Of course, you don’t have to ride the entire length. The trail is well marked and has frequent picnic tables, shelters, and water fountains, as well as easy access to local businesses. Lingering at the missions and parks, you could easily make a day of it or just spend a couple of hours riding out and back. Or just ride a few miles and enjoy this treasure that San Antonio has provided us. The Blue Star Brewing Company was one of the first brewpubs in San Antonio that has been serving their uniquely brewed beer and food since 1996. Shortly after opening The Blue Star Brewing Company, owner Joey Villarreal and his wife Magdalena opened the Blue Star Bike Shop within the walls of the amazing brewery, and later moved to its very own location right next door. The Blue Star Brewing Company offers organic brew and a selection of locally sourced food, The Blue Star Brewing Company is the place to relax and enjoy a well crafted meal before or after an adventurous bike ride on the trails. Tell them Been There Bike Tours sent you! e place to relax and enjoy a well crafted meal before or after an adventures bike ride on the trails.